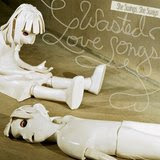 So says Darius of Wasted Love Songs by She Swings, She Sways on his music review blog, Oliver di Place. Don’t want to take his word for it? Go ahead and have a listen for yourself on She Swings, She Sways’s artist page. They didn’t have to travel far to find what they were looking for. The members of She Swings, She Sways didn’t even have to leave Iowa. The Ottumwa-based band will perform at noon on Friday at Java House, 211 1/2 E. Washington St., as part of the “Java Blend” series. The group has received positive feedback for its latest album, Wasted Love Songs, which was released in July 2008. The sextet is imbued with a bevy of musical influences. Having not grown up in the “Information Age,” they had to obtain their fill of music the old-fashioned way — radio and MTV — said guitarist/vocalist John Gordon. I first had the immense pleasure of hearing She Swings, She Sways at Crossroads conference a few weeks ago, and I’ll admit it… I went home to download the album and I’ve been listening obsessively ever since. and I maaay have a little crush on all of them. She Swings She Sways heralds (get it) from Ottumwa, Iowa and their album is available on Authentic Records. Wasted Love Songs, has climbed to the #14 most downloaded album on emusic this week. So forget the giving and download this for yourself. You deserve it. Congrats to She Swings, She Sways who’s album Wasted Love Songs is climbing up eMusic’s top downloads list! Today they’ve landed at #12. A band so nice I’m posting them twice. 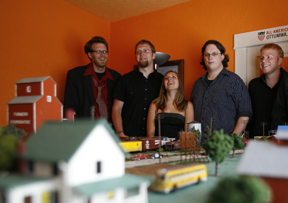 We’re bringing part two of our Crossroads Conference video extravaganza with two songs from Iowa band She Swings, She Sways. Scott and Andrew had the opportunity to visit and talk with She Swings in their hometown of Ottumwa recently for a Rock Iowa feature, so be on the look out for that soon.